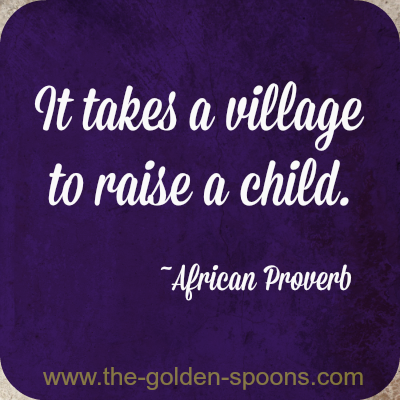 The Golden Spoons: Who's in Your Village? Although this phrase has been used to title multiple books and has been credited as an African proverb, it's exact origin is unknown. I believe, though, that it must have come from a mother. I remember the days in the first several months after my first daughter was born. I had left my career and, thus, my colleagues. However, none of my closest friend had children yet. I spent my days at home nursing, rocking, soothing - lost in becoming a mom. Many days, since my husband traveled for work, I had little or no contact with other adults. I felt very isolated. I hadn't found my village yet. Eventually, I did. One of my dearest friends had a daughter about six months after me and we began spending lots of time together. I found someone close by who wanted to have regular playdates. I joined a women's bible study group at my church made up primarily of young mothers. Then, we moved away to another state. I was once again on my own. After almost a year, we ended up returning to our previous city and to the friends and family we already had, but those months in between, in the new city were brutal. By then I had two children, a toddler and an infant. I knew no one. I had no one to baby-sit for me. I had no time at all away from my children. It felt like I was right back where I began. The one big difference this time, however, was that I knew how important it was to find my village. Right away, I found a MOMS groups and joined. I frequently lugged the kids and all the required "stuff" to the neighborhood pool in hopes of meeting some other mothers (which I did). Pretty quickly, we started visiting churches trying to find one that was a good ft for our family. And, on Saturdays, when my husband said for me to go to Starbucks and relax for a couple hours, I practically ran out the door before he could change his mind. Nowadays, my girls are older. As they have grown, I have evolved as a mother, and my village has evolved as well. One thing that has never changed, though, is how grateful I am to all the people who are part of my mommy tribe. Who are they? I'm glad you asked. Family - My extended family is a HUGE part of my tribe. My in-laws are literally my neighbors and are always happy to help me out with transporting kids or baby-sitting. I can't remember one time that I have asked and they have told me no. My parents are a couple hours away, but are more than willing to lend a hand when they can. My mom is my confidant and advisor. My kids ADORE all their grandparents and I would be lost without them. Friends - I have never been one of those people who has tons of friends, but I have a couple super great ones that I cherish. They have seen me through the ups and downs of motherhood and, hopefully, they feel the same way about me. My Church - This won't be on everyone's list, but it is an important part of my life. My children attended preschool at my church and I have attended several parenting classes there as well. Many of those friends I referred to above, also came from my church where we met and studied together and where we continue to raise our children together in faith. The Schools - Right now, I have two children in elementary school and one in middle school. Although I'm not really part of the "Cool Moms Club" at either school (you know what I'm talking about! ), I still view the school at part of my village. After all, they spend as much or more of the day with my children than I do. They can offer me advice or perspective about where my children are developmentally and give suggestions when problems arise. As a former teacher myself, I hope all parents view their children's school as an ally. The Blogosphere - It may sound crazy to those who don't blog, but some of my best friends are other bloggers and, some of them, I have never even met. Through our blogs, we share stories - fears, joys, frustrations, and all the things that motherhood entails. Not too long ago, I emailed sweet Chris for advice on an issue I was/am working through with one of my kids. She was supportive and gracious and so totally genuine in her response. Just a couple days ago, I commited the cardinal sin of vague commenting, but Kristi "heard" me and followed up to make sure everything was okay. We share our lives with each other and they are my tribe - in the blogosphere and in motherhood. Last but most definitely not least is my husband. Having children was a decision we made together and parenting is something we do together. We have different roles, different approaches, and, sometimes, even different expectations, but we are a team. He supports me and I support him. We laugh about our children and we get frustrated with them. We strategize ways to discipline and ways to make sure the kids are getting everything they need. He is and always will be my #1 partner in parenting. Not all villages look like mine. Some people have strained relationships with extended family or live too far away for them to be really involved. Some families do not choose organized religion and some choose homeschooling. Others may have neighbors or colleagues they consider to be a part of their support system. Of course, not everyone is a blogger. It doesn't matter who is in your village, though. What matters is that you have one, big or small, that supports you, encourages you, and makes your journey through motherhood a little less stressful and a little more joyful. 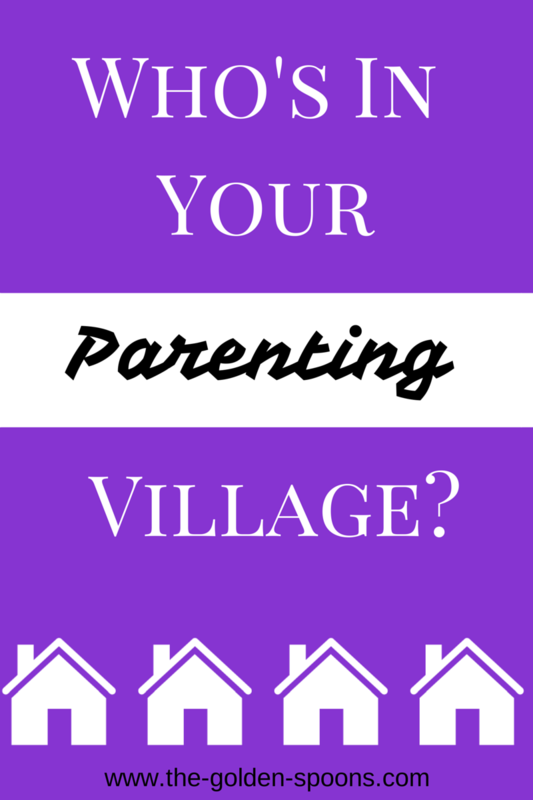 So, tell me, who's in YOUR parenting village? I got to say I feel blessed in this area as in my life I not only have a great husband who does try his best to share the parenting responsibilities, but my parents and even my brother do their best to help pitch when we need with the girls. I also like you feel blessed that when I do have any questions or just need a bit of moral support I have other friends who are mothers in real life and the blogging community, as well. So overall I am just so thankful for this and more. It's so interesting because it goes in waves, in which some people are more in the forefront than others, but the ones in the background shine at times too. I have my parents and in-laws, siblings and friends - both in person and online. Neighbors and babysitters. Teachers. Classmate's parents. And more. Sounds like a wonderful village, Janine! That's awesome - sounds like a fabulous village! I think that's the best kind of village because it's the most genuine! I love this sentiment. My village includes my family, my church friends and the students I work with. I wouldn't normally include my in-laws (their loss) but if the chips were really down, I might be able to call on them. This really hit close to home. I had such a great support group of friends & my husband when my son was born. It helped so much. My son is now 2 & we moved to a new city 300 miles from home. I don't know anyone out here, there's no MOMS club like there was back home, but I'm trying to put myself out there & join meet up groups. I think everyone's village looks different and I love that you would include your students! I know that feeling all too well! I hope you are able to find a new support group soon! I feel very lucky to have a great parenting village. My husband, parents, in-laws, sibling/siblings-in-laws, and friends. They all give me different perspectives and wisdom, and I don't know where I'd be without them. This is so important! Every once in awhile I meet a blogger who feels disconnected and alone in parenting, and my heart aches for her. I encourage her to find her tribe, whether it is online or in person. Sounds like you do have a great village! I agree - I always encourage other moms to find a group who will be supportive. I have a great parenting village - friends, family, neighbors, church members, and other people that have come in and out of my life for a season or more. I don't know how anyone can parent without the village!